I would have one chance. If they caught me trying to escape, Shaun would either kill me on the spot, or let me live just long enough to wish he had. I collapsed against the porch railing. I could feel my heart breaking, splintering into irreparable fragments. Pressing my face into my folded arms, I made a deep sound of agony. Tears streamed down my face. The nightmare was dragging me back, to a depth I had not known existed. He winced, reaching for his pack. "We've got moonshine and gauze. I'll be fine." "What if it gets infected?" He looked directly at me. "Then I won't be fine." Britt and her bestfriend Korbie are going to spend their spring break at Korbie's family cabin up in Wymoing with Korbie's older brother/Britt's ex-boyfriend, Calvin, and Krobie's boyfriend, Bear. However, on the way there an unexpected snow storm hits and the girls are stranded in the middle of nowhere. After hiking for about an hour, they find Shaun and Mason in a cabin. If it seems too good to be true, it is. Shaun and Mason are both on the run and, after telling a few white lies, instruct Britt (at gun point) to lead them off the mountain. Initially, I didn't like Britt. She took a long time to grow on me - and it wasn't until she was stranded in the middle of nowhere with Shaun and Mason that I did like her. She portrays herself as helpless and allows the men in her life to take care of it. It isn't until she can only depend on herself that she shows her true colors. Of course, during this ordeal she keeps thinking/hoping that Calvin will magically show up and save her. I wasn't crazy about her Calvin obsession, he did suddenly break-up with her without much of an explanation, but at the same time Calvin is her first love. We've all been there and given her age and the situation, it's understandable. So I can forgive her for this. I don't care much for Korbie, who calls "dibs" on Shaun despite the fact that she has a boyfriend and is in constant competition with Britt, even when they're stranded in a snow storm in the mountains. I really don't see how they're best friends, but "acted more like sisters." Maybe I just have too good a relationship with my friends and sister to get it? And maybe I have a bit of Stockholm Syndrome, bonus points to Britt for acknowledging this, but I'm a fan of Mason. And that's all I'm going to say about him because this is a story where regarding both characters and plot, it's best to go in as blindly as possible. 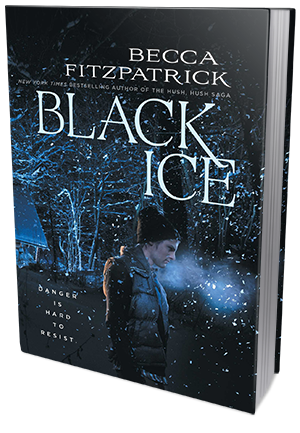 I figured out the ending about half way through the book, but in no way did it take away my enjoyment of Black Ice. I still flew through these pages, indent on finding out what was going to happen. I was entirely focused on the events unfolding before me and wanted nothing to do with the real world until I finished. I was up until midnight reading it and only stopped because the light was bothering my husband and my book light had died. When I woke up the next morning, I skipped my workout so I could finish the last 100 or so pages. I just had to know what was going to happen! This novel is, in my opinion, what is missing from YA: thrillers. Straight up thrillers. Not the "We need to save the world before they destory and/or enslave us!" or "We must overthrow this evil totalitarian government!" but just straight up thrillers. And that is what Becca has given us with Black Ice. An exciting and nail biting thriller that will have your heart racing and wondering what obstacle our heroine will find next in her fight to survive.